Casa de las Flores is appropriately named for the abundant natural flora and fauna surrounding this enchanting residence. 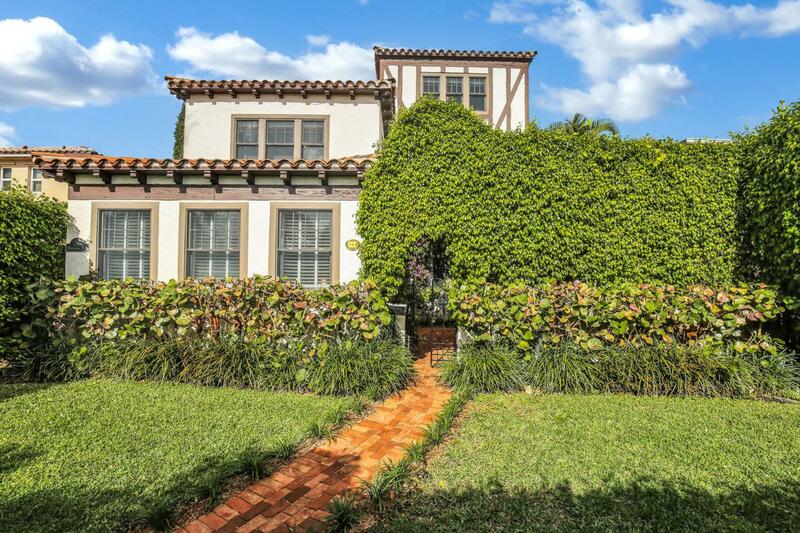 Close to the excitement of growing West Palm Beach, this calming oasis is a wonderful example of Mediterranean Revival 1925 architecture. It combines the best of everything; a 3BR/2.5BA private main residence, a detached 2BR/1BA guest house with an additional 2-room, 1/2 bath bonus space, and relaxing outdoor living spaces, all in a perfect Intracoastal WPB neighborhood. Enjoy morning coffee in the private courtyard surrounded by bougainvillea and palms with the trickle of the fountain. Upon entering the residence through the original pecky cypress door, you are surrounded by Old World details: the tall ceilings, hardwood floors, pecky cypress accents,elegant fireplace, and an overall spacious feeling. The living room is located adjacent to the dining room, featuring pecky cypress beams and a wonderful view of the courtyard. The adjacent light and bright Florida room serves as an informal family room with access to the driveway for convenience. The renovated kitchen balances a 1920's period "feel" with modern convenience including new high-end cabinets, matte finish granite countertops, stainless steel appliances, wine fridge, Carrera-marble back-splash, and a tin-detailed ceiling. A great feature of this kitchen is the additional storage available in the butler's pantry located between the kitchen and dining room. The first floor powder room and large laundry room provide convenience and utility. The second level guest bedroom features double French doors opening onto a Juliet balcony overlooking the lush courtyard below. A renovated hallway guest bath maintains the charm of the original with hexagon tiles and white fixtures. In the roomy master bedroom, many windows spill light into the space. His and hers closets flank the entrance to the gorgeous master bath. This recently-renovated bath, done in black and Carrera marble, combines the elegance of a 1920's club with the clean lines of today. A soaking tub, large rain shower, and double vanity create a luxurious escape from a long day. Ascending the next stairway in this unique home, the third floor guest bedroom awaits with high-beamed pecky cypress ceilings, hardwood floors, lots of light, and rooftop views...You might even see the Intracoastal Waterway. Exiting the rear door into the lush outdoor space, you are greeted by a patio dining area, a separate conversation area, and the beauty of the cool and colorful indigenous landscaping. This escape is Florida's Best Indoor-Outdoor living arrangement right in your rear yard. The detached building has four features; a recreation room/office, an upstairs guest house, a roomy storage space, and a one car garage. The self-contained recreation room/office downstairs has a bath, and can serve a variety of functions; separate office, cabana room to get out of the sun, man cave, game/billiard room, or just to relax and have a drink in a different setting. The upstairs guest house is absolutely charming with hardwood floors, lots of windows, and period features like a claw-foot tub. The kitchenette is open to a cozy dining area that is perfect for a home-cooked meal or playing some cards with friends. The second bedroom/den has a large walk-in closet for more storage. The master bedroom is private and has an updated shared bath. It can be rented to generate income, or as a perfect guest/in-law suite. Southland Park compound is perfect in so many ways and the location is outstanding for quick access to shopping on Antique Row or Worth Avenue, downtown attractions, parks and waterway, airport, and even the beach. Take time to explore and learn why Casa de las Flores is the perfect place to call home.